Conventional chandelier cleaning requires the tedious and time consuming unhooking, cleaning and replacing of every individual piece of crystal. More modern fittings cannot be unhooked so the whole fitting has to be removed or the individual pieces have to be cleaned in situ. Antiquax have made the whole process, easier, faster, safer and more economical. 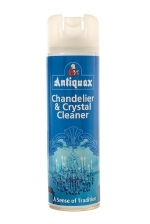 Chandelier and Crystal Cleaner is fitted with a special high capacity spray nozzle that allows the cleaner to spray further than conventional aerosols. In order to clean a chandelier of any size, simply spray the whole chandelier (avoiding any electrical parts) until the cleaner and dirt drip off onto newspaper placed below. Once the dirt has been removed, allow any remaining cleaner to dry, leaving a streak free sparkling finish. 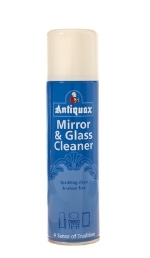 The solvents in Antiquax Glass Cleaner ensure a smear free finish to all glass surfaces including, windows, tables, doors and mirrors.